During our visit to the Australian Reptile Park near Gosford, NSW last Sunday, we heard a very entertaining talk about reptiles given by one of the keepers. All through the talk I kept an eye out for any birds flying overhead or perched on nearby branches, such as the Rainbow Lorikeet shown above. 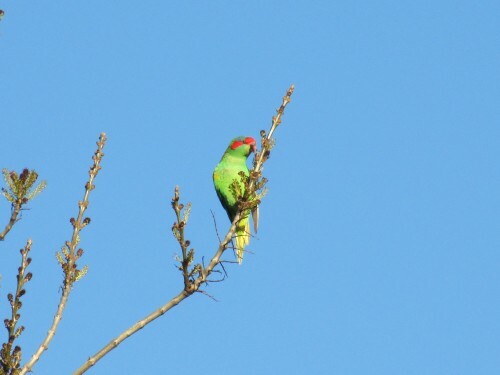 This species of lorikeet was probably the most common bird in and around the park, their constant screeching giving a noisy background for all the talks. Another common species was the Sulphur-crested Cockatoo, also very raucous all around the park. 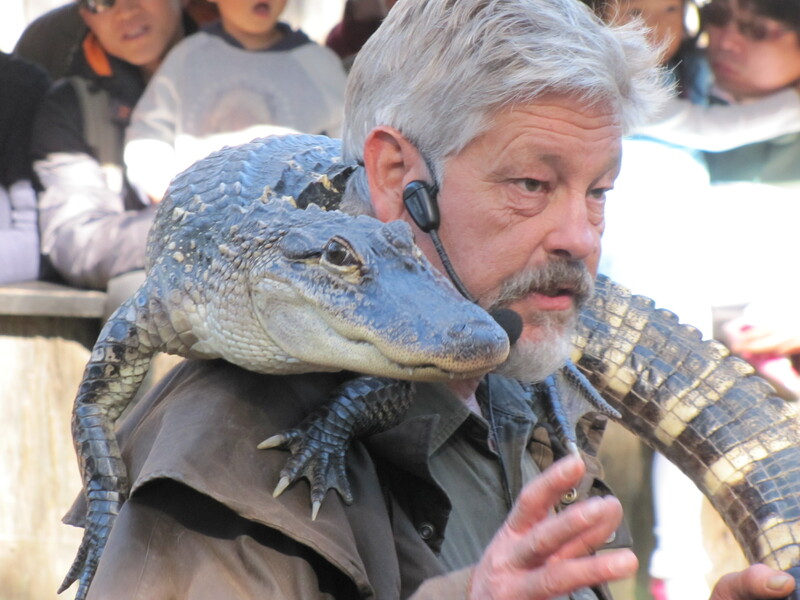 Featured in the presentation was the keeper’s pet alligator, Rosie, shown below. Rosie was well trained and very well behaved. Another animal shown by this keeper was the Lace Monitor, also shown below. The markings on the monitor, a large Australian lizard, are quite remarkable. 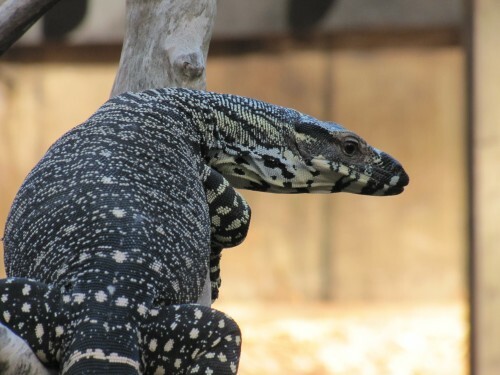 The Lace Monitor, often called a goanna, is the second largest lizard in Australia. On one occasion I have seen this species in the bushland not far from my son’s home in inner North Shore Sydney. Last Sunday I was in my daughter’s back yard in Clare sitting in lovely winter sunshine. I was intent on the novel I was reading and trying hard not to doze off in the warmth of the sun on my back. A small flock of about a half dozen Musk Lorikeets noisily flew into the neighbour’s almond tree. 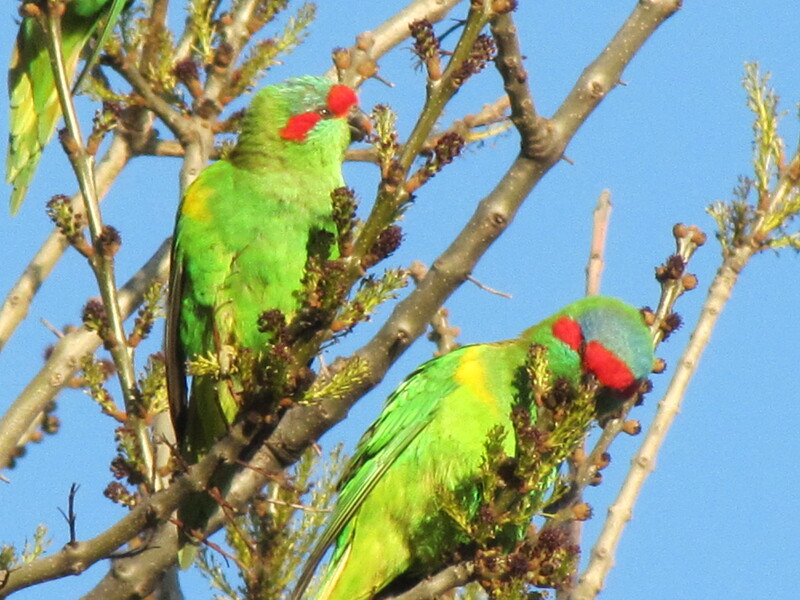 I firstly checked them out with the binoculars; I’ve also seen Purple-crowned Lorikeets in this locality. I then grabbed my camera and quietly walked to the fence. Zooming in I could see that they were not going to be easily spooked. The unopened flower buds on the almond tree were obviously good eating. In the next two minutes I managed to get 18 really good photos, some of which I share on this site today. Musk, Purple-crowned and Rainbow Lorikeets are relatively common and widespread throughout the Mt Lofty Ranges and the mid-north of South Australia, and elsewhere such as the south-east of the state. 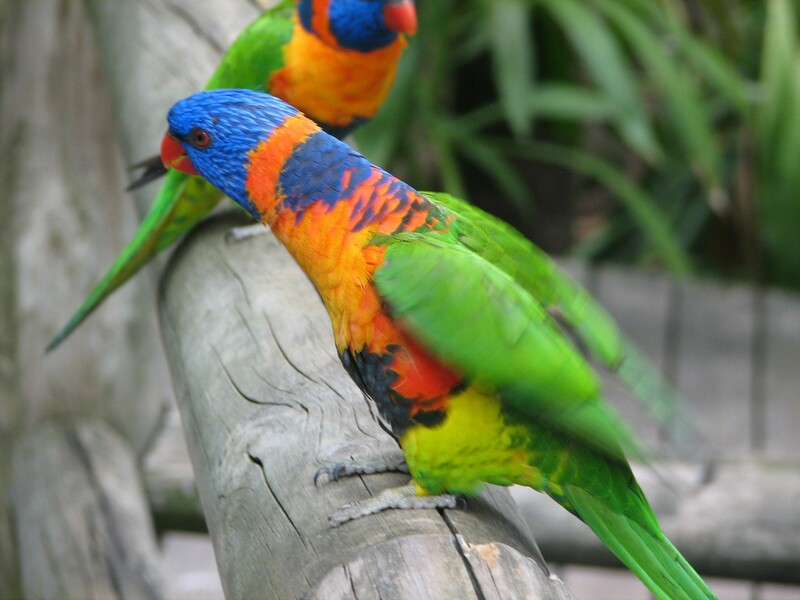 They can be seen in some places in large numbers, noisily feeding in eucalypt trees in particular. 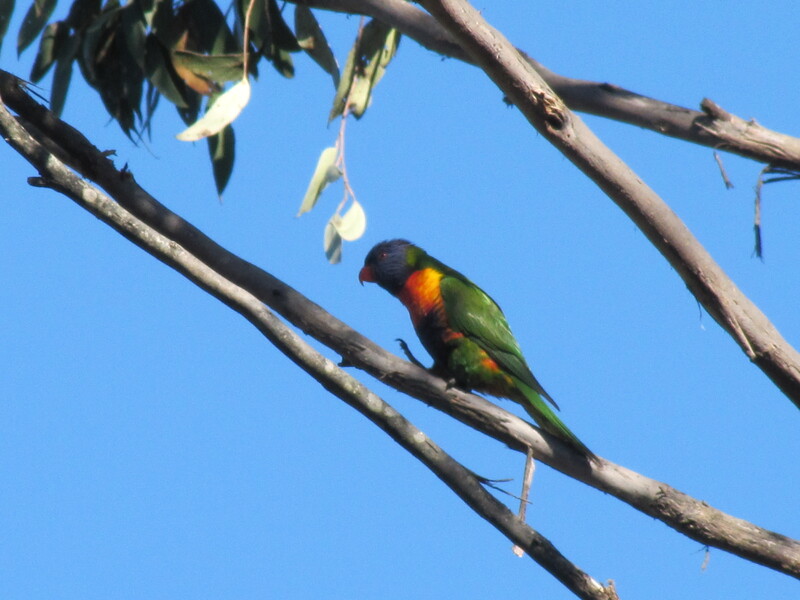 When they are feeding in the dense canopy of a gum tree (eucalypt) they can be very hard to see, let alone photograph. 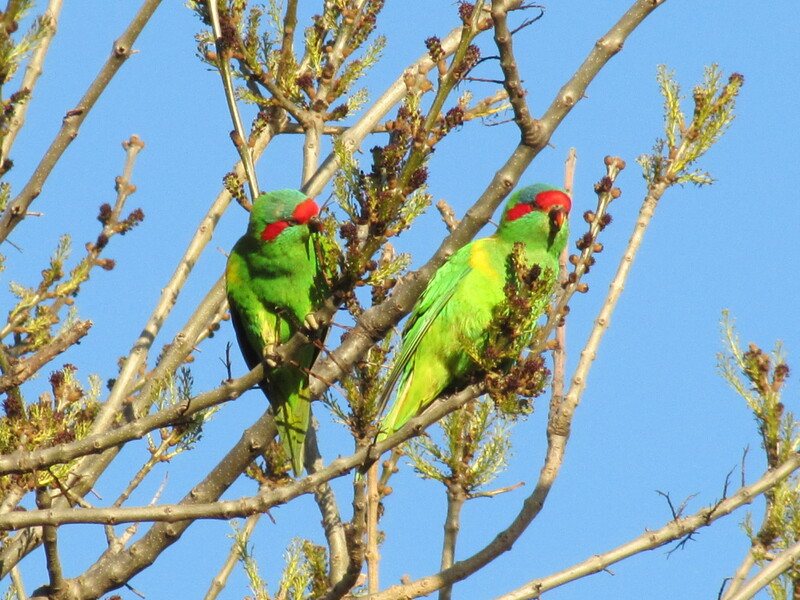 So seeing them feeding in a tree with little foliage made photography so much easier for me. I wish all birds were so accommodating. My wife and I are currently staying in Sydney with our son and his family. We are having great fun playing with our two grandchildren age 5 and 2.5. We will be here until Christmas. Because of the configuration of the house, the spare bedroom is at the back of the house, next to some large bushes and near to some large street trees. Up until recent days the Laughing Kookaburras have woken us before 5am; one morning it was 4:33am. As first light filters through the trees the hundreds of locally resident Rainbow Lorikeets start up their screeching as they fly from tree to tree. Because of those two noisy resident species we treasure every second of sleep we can get, especially when the grandchildren usually knock on our door well before 7am. 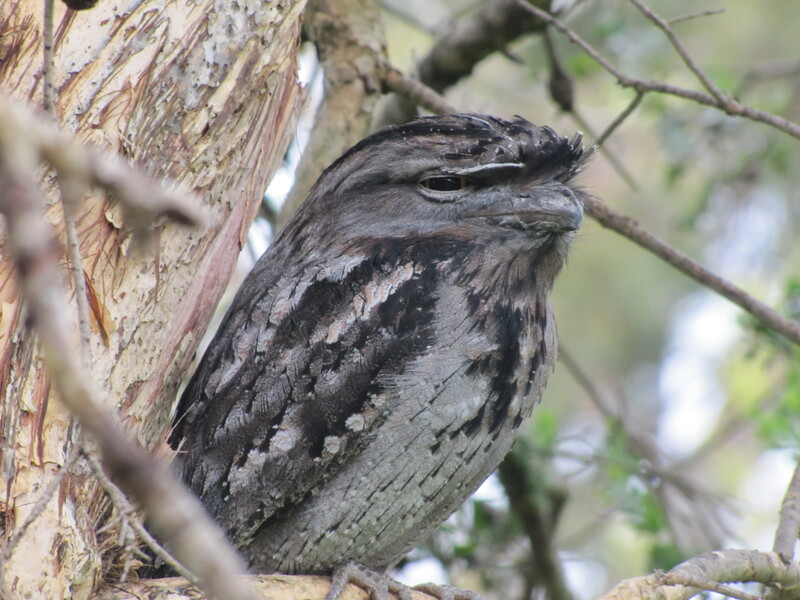 So it was a little disconcerting to have a Tawny Frogmouth doing the overnight shift, calling just outside our bedroom window! Fortunately, the call was soft enough not to keep me awake. 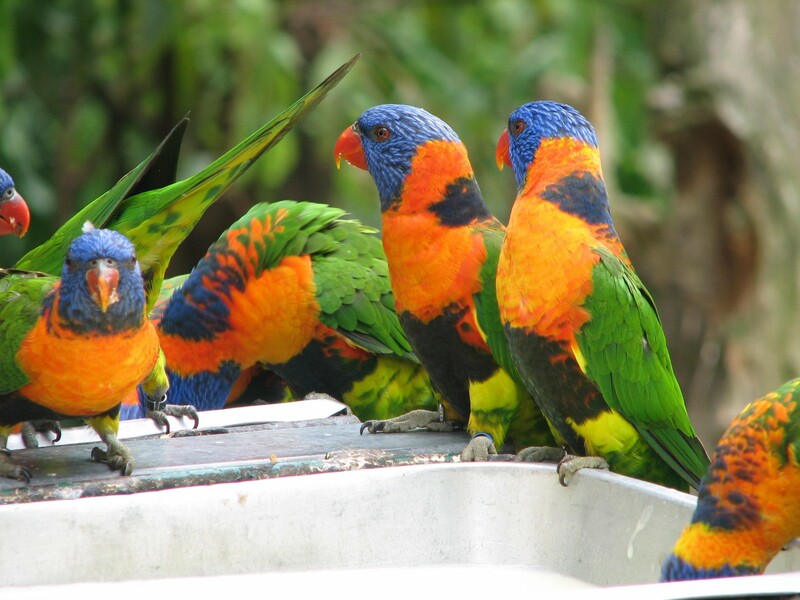 I am quite familiar with the Rainbow Lorikeets we have here in South Australia. They are also found in many parts of the eastern states. 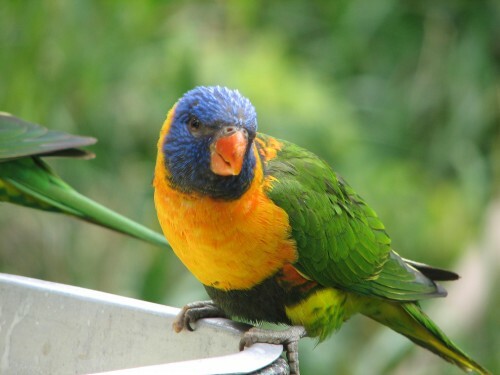 For example, the noise of roosting flocks of lorikeets in the trees in the street where my son lives in Artarmon on the North Shore of Sydney can be quite deafening at dusk. From time to time we have small flocks settle in the trees on our five acre block, but more often we see and hear them darting across the house at speed. In my experience, numbers can vary from a few – perhaps two or three – through to many dozens – or more. 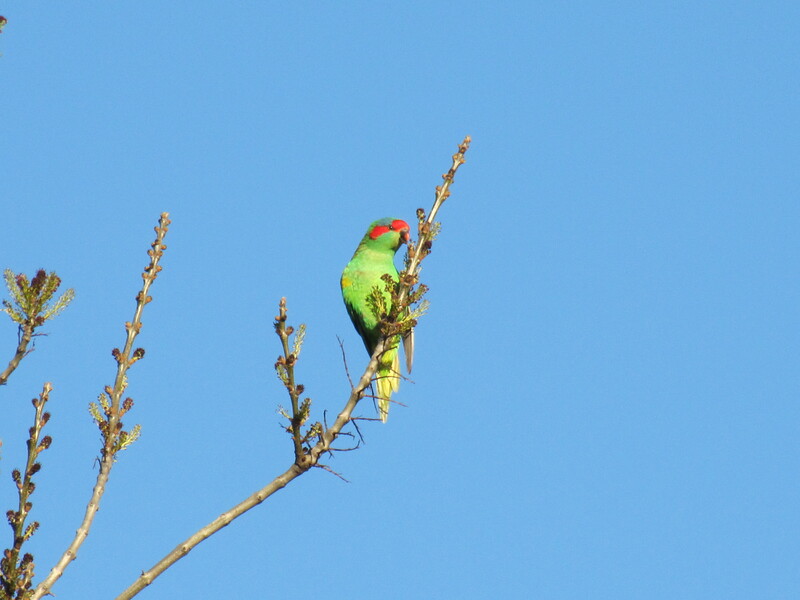 A distinct race of the Rainbow Lorikeet is the Red-collared Lorikeet which I have featured in today’s photos. They are just as colourful and just as gregarious; their noise when feeding can be deafening. 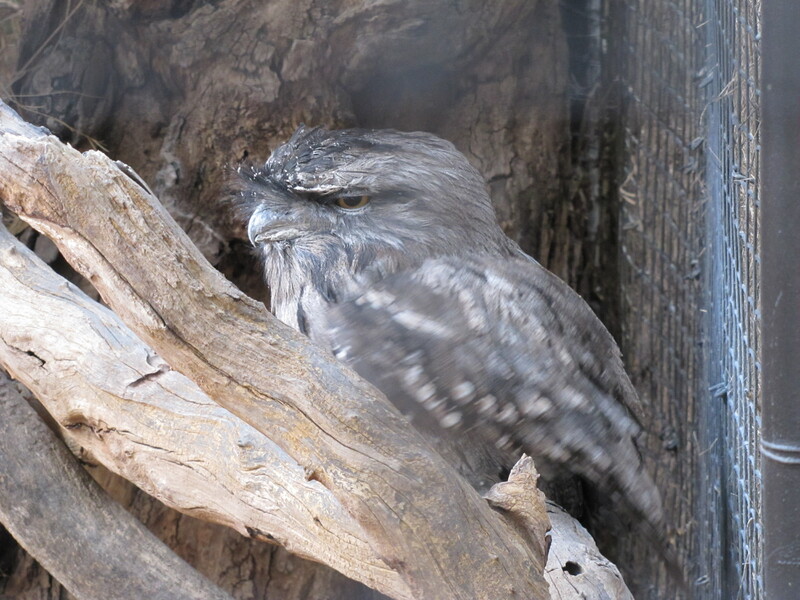 On a recent visit to Adelaide Zoo I timed my visit to the walk through aviary perfectly, more by accident than design, I might add. 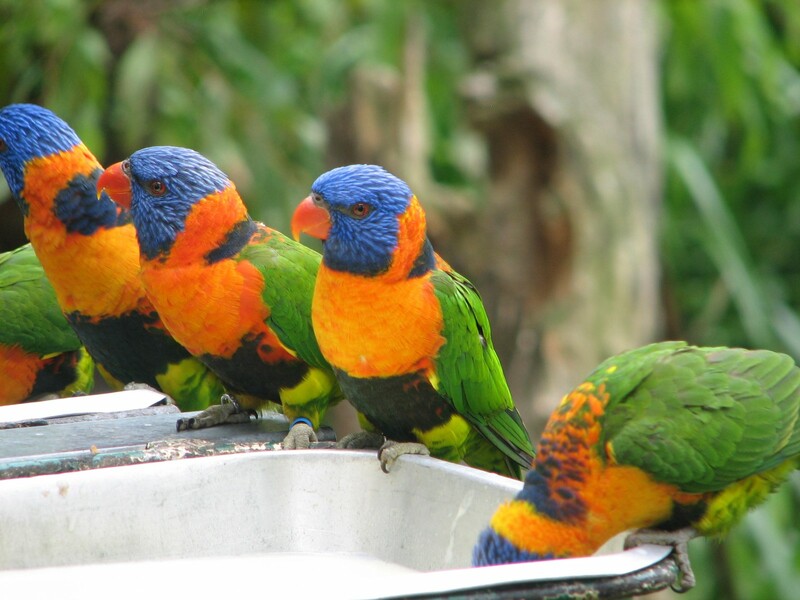 The keeper had just fed the birds in this aviary and the lorikeets were having a feast – and letting everyone know about it. Their feeding frenzy made it easy to get some great photos. Red-collared Lorikeets are found across the northern parts of Australia. This afternoon my wife and I accompanied our 19 month old grandson and our son on a visit to Chatswood on the Sydney North Shore area. The Chatswood CBD is an easy twenty minute walk from his home. We found a good spot to have a delicious lunch and later did some shopping. It was dark when we left on the homeward walk. My attention was drawn to an extremely noisy group of birds calling just outside the doors of one of the shopping precincts. In three medium sized street trees there must have been several hundred birds, all calling raucously as they settled down to roost. 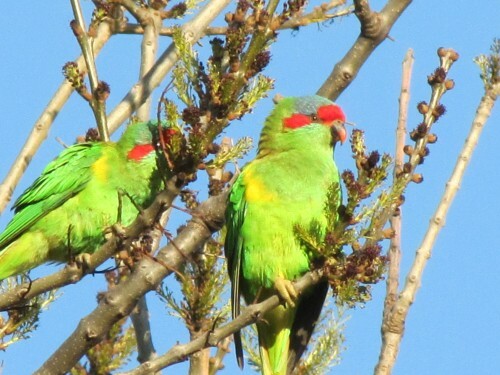 In the little light coming from the shops I was able to determine that they were Rainbow Lorikeets. I can’t ever recall seeing so many together in such a small area. Earlier on when heading for Chatswood we saw two Rainbow Lorikeets feeding near the footpath. I regretted not having my camera with me. I would have got some excellent shots. You’ll have to put up with photos taken elsewhere some time ago.